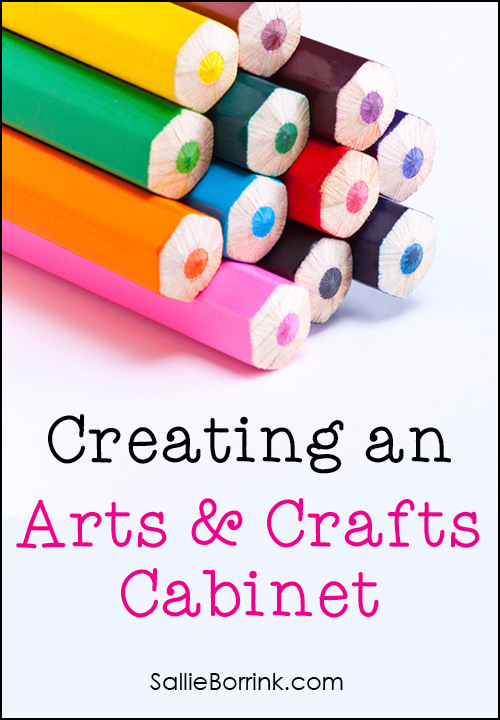 Since we homeschool and have a creative child, keeping a well-stocked selection of arts and crafts supplies is imperative in our home. I also believe that the supplies need to be readily accessible to the child and well-organized so they can easily be enjoyed. Today I’m going to share what we have on hand and I hope others will chime in with additional ideas! One key for me was to organize this using things I already had in the house. I would rather spend my money on actual craft materials than fancy organizers! The top shelf has items that require permission. The second shelf currently has phonics items on it because I haven’t moved them elsewhere yet. Everything has a specific place in the cabinet so Caroline knows that when it is time to pick up, everything has to go where it is supposed to be. I utilize small plastic storage bins of various kinds, plastic pencil boxes, a clementine orange crate, gallon zipper bags, a winter boot box, freezer containers, and other assorted containers. Again, I went through the house and used things I already had. The only supplies that aren’t kept in the cabinet are paints and the other easel-related items. Those are kept in the basement where they are used. The easel is in the basement because we don’t have room for it in the learning room and the learning room has off-white carpet. Enough said. This is what we currently keep on hand. There are some things I want to add for the fall and I’ll list those at the end. Most of the items on this list were purchased inexpensively, especially during the back to school sales. The more expensive items (like the easel) were Christmas and birthday presents. Some items we started off with a small amount (like the clay) and then bought a large box of it at Hobby Lobby when Caroline showed a strong interest in it. I also like to look at what’s new in the Amazon Arts, Crafts and Sewing section. 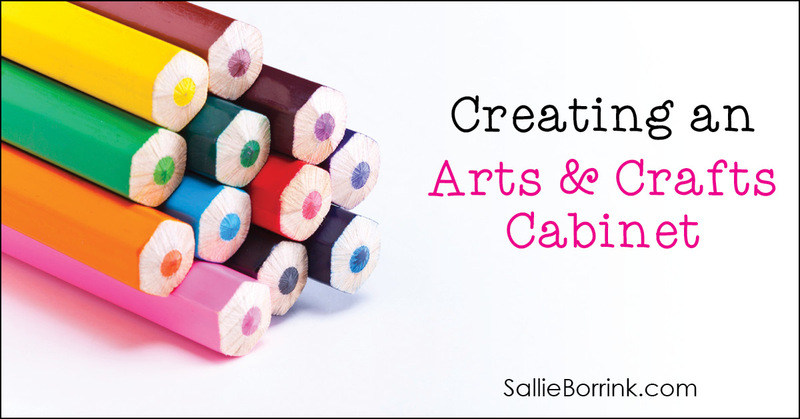 What are some of your art supplies and craft ideas? I would love to surprise Caroline with some new things! My children also like envelopes, stencils, and paper bags. Peggy – Good ideas! Caroline loves envelopes, but I’ve never put any in there just for her to play with. She usually asks me for one. I seem to remember that greeting card shops often have bunches of them for sale for just pennies… Hmmm…. Might have to make a phone call and inquire about that! Oh, I would love to set up something like this. With our kids, it feels like, throwing art supplies at the wolves. This is exactly the post I needed! 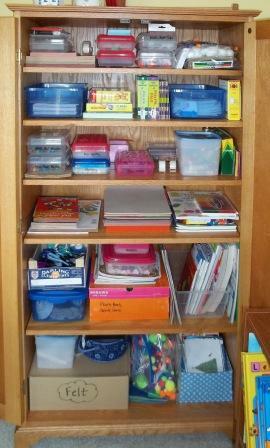 I really want an organized space for all our supplies and I was thinking about how expensive it was going to be! This will be perfect and cost effective! Thank you for sharing. Each of my kids had a box for saved projects. They could put anything they wanted in their box, but when the box was full, the had to remove something to make room for new offerings. We took a photo before throwing something away. Also, from time to time, we would mail one of their projects to Grandma to spread the love! We just started using an idea similar to Kim’s that I learned from a scrapbooking blog: we have a box for each kid and all projects that they want to keep go in the box. During summer break (or whatever time of year you have the time), we go through and the kids get to keep their 10 favorite orginals in a binder or scrapbook (12×12 is nice – fits slightly bigger projects, but obviously this doesn’t apply to clay and such), throw away those they no longer like, and the rest are all photographed or scanned and those pictures go in a scrapbook (super easy and pretty cheap with photobooks from Costco, Snapfish, any photo website).